Is there anything more synonymous with camping than the tent? Whether you're just getting started or looking to upgrade, the shear number of options can be mind boggling. Here's a quick and handy guide to buying the right tent for you. Why Tents? Do you need a tent to go camping? If you're asking that question, then the answer is a definitive yes. While other shelter options like tarps or just sleeping under the stars exist, they typically require sacrificing much weather protection, comfort and security. I know many a grown man who talks a big talk, but when it comes to sleeping outside, won't get a good night's rest without a psychological barrier between themselves and the rest of the big, scary world. Weather conditions and other factors can also be very hard to predict outside, with most mountain ranges having their own microclimates creating precipitation, wind or other weather that you won't find predicted on your phone. Then there's bugs. Oh, the bugs. Tents do a remarkably effective job at keeping those off. For just $100, you cannot beat this Alps Mountaineering Two-Person on value-for-money. It's certainly not the lightest or fanciest tent out there, but it will get the job done, keeping you dry and comfortable for years to come. Which Type Of Tent Is Right For You? What kind of camping are you going to be doing? If you're staying in an organized campsite, next to your car, then you want the biggest, heaviest, most comfortable tent possible. But, the second you have to carry that tent any distance, you're going to want something prioritizing low weight and small size. And, if you plan on putting in a lot of miles, then you're going to want the absolute lightest shelter possible, sleeping comfort be damned. Let's break tents out into three main categories: campground, backpacking and ultralight. Campground: What you want here is comfort, space and versatility. What you sacrifice is portability. These tents are best if you plan on camping within striking distance of your car. They're also great places to spend time if there's inclement weather. Large vestibules make great places to hang out, protecting you from the sun, rain or bugs while you cook and chill. Backpacking: A happy middle ground between comfort and portability, the vast majority of you will be best served by a decent backpacking tent. You'll be giving up space when you're doing campground camping, but more than making up for it in that you're buying a single item that can also work on the trail, on the back of a motorcycle or anywhere else. Ultralight: A minimalist shelter prioritizing ease of carry over comfort. Just the ticket if you only plan to use it on the trail, but not a great place to spend time if you're looking to hang out in it during a daytime rain storm. Ultralights also typically carry a large price premium over regular backpacking tents due to their lighter, fancier materials. What Seasons Mean: You'll typically see tents rated as three or four seasons. That's a bit misleading. Three season tents are just that — they won't work great in high winds, insanely cold temperatures or under heavy snow loads. "Four seasons" can be read as meaning winter only. They do a better job at sealing out the elements, standing up to high winds and make more room for gear storage in larger, all-encapsulating vestibules, but do so at the expense of weight and cost. The vast majority of you will be just fine with a three season tent, even in most winter camping scenarios that don't involve ascending 14,000-foot peaks using ice axes. What Men Mean: You'll see the size of tents listed in the number of "men" they hold. There's no industry standard for what measurements that represents, but figure on an average sized adult, snugly. A one man tent fits just one person. A two man fits just two people. Size up for more space, particularly if the "men" you may have in the tent aren't pre-existing snuggle buddies. For example, Lara and I's general purpose backpacking tent is a three man, making a little extra room for comfort, gear storage and Wiley. Fitting an 85lbs dog inside a two man with the two of us is extremely uncomfortable. Having said that, the interior floor space of a tent is going to vary outside of the "men" parameters. To get a better idea of the space any tent you're offering has, look at its dimensions online, then measure them out on your floor at home, using painter's tape or similar to mark out the size. Then, put your air mattress(es), sleeping bag(s) and whatever else you'd want inside that outline and you'll have an idea of how much space you're working with. Sans rainfly, the whole tent should be a window. Rainflies, Vestibules and Windows: Unless you're buying some weird ultralight contraption, you want a tent with a mesh body (the smaller the holes in that mesh, the more bugs it'll keep out) or a body with large mesh panels for good ventilation. An all-encompassing rainfly that extends to the ground should cover that, creating at least one "vestibule" (think porch) for stowing muddy boots and other gear you want to protect from the rain. 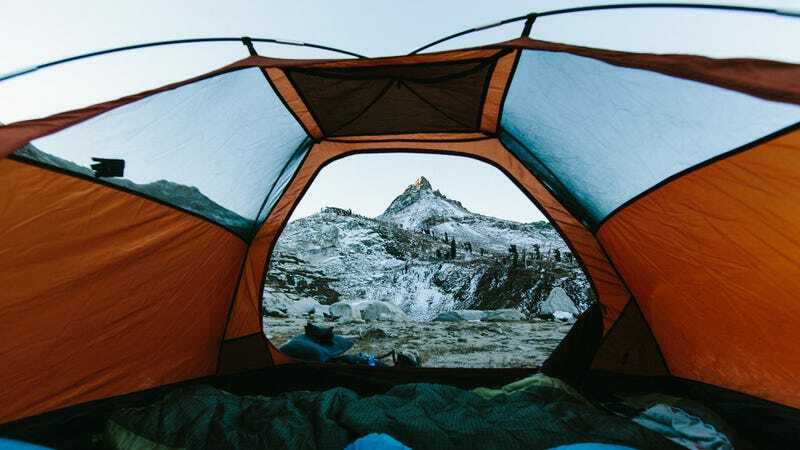 That rainfly should connect to the tent in a manner that allows adjustment and it should include points for fixing "guy lines," ropes that you stake out to draw the rainfly tight. This keeps it from noisily flapping about in the wind. Windows are silly and unnecessary; you'll be spending most of your time in the tent during the nighttime. Instead, look for vestibules that provide good weather protection when their doors are zipped open. This will allow you to achieve maximum ventilation while keeping rain out. Perfect for summer storms. The exception here is obviously those giant family camping tents you'll use in campsites, windows on those are nice to have and, as far as I know, they all include them. Materials and Bathtub Floors: If a tent lists what kind of nylon it's made out of, then that probably means it's a good quality tent where the strength, weight and durability of its materials have been considered. Most don't bother. You shouldn't bother with tents that have polyethylene floors (the same material as blue construction tarps). While those will be waterproof the first time you camp, they quickly fall apart and are generally just cheap and heavy. Some "four season" tents have heavy vinyl floors. These are obviously great at being waterproof and durable, but they're heavy. 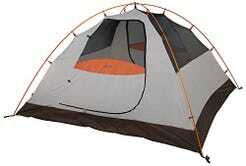 Look for a floor that extends 4 to 6 inches up the tent's sides, all the way around. This is known as a "bathtub" design and is more effective at keeping water out. You want to keep water out. Tent floors are relatively delicate things. Endeavor to keep them clean (a little handheld broom helps here) and mind the surface you're pitching on. Remove rocks, sticks and whatnot ahead of time. "Footprints" are an extra layer of that floor material, cut to size, which helps protect the tent floor from being pierced, cut or abraded. They're a good idea, but a sheet of 6 mil plastic that you cut to size yourself works even better and is virtually free. Where possible (ie during car camping) lay a blanket down on the tent floor to help protect it. Never wear boots inside a tent. Lara, Wiley and I's do-it-all tent is this $167 Alps Mountaineering Aries 3. At 6 lbs, 2 oz, it's just about carry-able and affords large interior space space, huge vestibules and great weather protection. Domes, Cabins And Tubes: Tents come in three main shapes and sizes. Which one is best for you depends on what you want from it. Cabin: Nearly vertical walls create the most space inside, as does a tall roof you can stand under. But, this design won't stand up to high winds. Most frequently found in campground tents, where space is your main priority. Domes: A more efficient design than the cabin that cuts weight while still allowing for decent space inside. These are now mostly outdated, but can still be found on budget backpacking tents. Hoops: Crazy-looking designs designed to radically slash the number of poles used and therefore the weight you have to carry. These also stand up best to high winds. Non-Freestanding: Tents that won't stand on their own without stakes providing tension. Typically found in ultralight tents, the configuration helps ensure a light weight, but can prove a hassle on a beach or above a tree line. Be a more experienced camper if you're considering one of these. A-Frames: Don't, you're not a Boy Scout in the 1950s. I've carried a Sierra Designs Lightyear 1 for seven years, across continents, in horrendous weather. It's never let me get cold or wet and I trust it to this day. It's now been replaced by the Flashlight 1. Poles: Giant campground tents may still come with separate aluminum poles you assemble separately. Everything else will have aluminum, fiberglass or carbon poles attached by internal bungee cords. A carbon pole is obviously going to save some weight, but cost you some more money. Evaluate the tent's total specs and see if its cost-to-weight ratio is worth it. Some tents are now supported by hiking poles. As far as I'm concerned, hiking poles are for sissies. If you can't balance yourself with a backpack on, go to the gym and do squats. If you are the kind of sissy that uses hiking poles, then you may be able to save some weight by using them as your tent supports. I have to admit, this does make some sense. Such sissy arrangements typically don't stand on their own though, requiring sissy tension applied by sissy stakes. This just-announced MSR Flylite promises to combine good, two-person interior space with a drastically light, 1 lbs, 9 oz weight. $TBA, we'll test it ASAP, but our manhood may dictate sticks in place of the hiking poles. How To Make Any Tent Waterproof And Long Lasting: Before you embark on your first trip, do a practice pitch at home. That'll ensure that you have all the parts and know how to set it up properly, which you may have to do in the dark, in the rain or both once you're outside. Buy a can of this stuff (it's the absolute best, promise) and liberally coat all the seams in your tent's floor with it, inside and out. Then, do the same with the rainfly. Leave the tent up overnight, in a well ventilated area, to dry. Repeat this between trips and you'll never get wet. After any camping trip, pitch the tent in a well ventilated area, ideally outside during a sunny day and leave it up for a few hours or until completely dry. Do this whether or not the tent got wet during the trip, but especially if the tent got wet. This will prevent mildew from forming. I am constantly amazed that people don't know to do this, I've had a number of tents ruined by negligent friends who borrowed them, then returned them days or weeks later without having dried them out. Even if it doesn't rain during your trip, there will be dew and condensation from your breath on the tent, set it up once you're home and make sure it has the chance to dry thoroughly. For an upcoming beach camping trip on Maui, Lara and I picked up this Kelty Airlift 4. It's got a big interior for our queen-size air mattress and a large vestibule to shelter us during Hana's frequent, but short downpours. How To Keep Snakes, Scorpions, Ravens, Foxes And Mosquitos Out: While camping on Santa Cruz Island last summer, I watched as ravens repeatedly unzipped tents, stole the shiny stuff inside, then as foxes climbed in, peed on everything and stole food. I've also heard more than one story of someone climbing into a sleeping bag only to find a snake or scorpion already in there. Yeesh. Any time that you are not in the tent, zip it closed with both zippers at the top of the door. If there are problematic critters in the area, tie the zipper pulls together. This not only puts the zippers out of the reach of the pesky little guys, but prevents even freakishly smart birds from undoing them. Leave your sleeping pad and bag rolled up until you climb into the tent to go to sleep. 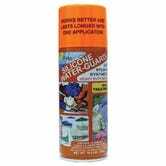 This will not only keep creepy crawlies out, but helps keep your stuff dry too. I'll say it again: no matter what, keep the tent completely zipped shut when you're not in it. If You Can't Stake: Camping on loose sand, snow or on hard rock? If you can dig, do dig, then tie some line around a buried stick, rock or bag o'dirt. If you can't dig, carry over some heavy rocks or logs and tie the tent to those. Or, if you have a freestanding tent, just put your stuff inside it, which should keep the tent from blowing away in all but the heaviest wind. Sticks make great stakes if you bend or lose yours. Which Tent Is Right For You? 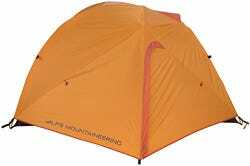 Unless only you're going car camping or are an experienced backpacker looking to shed more weight or are forever alone, just buy a basic two-person backpacking tent. That'll serve you well from solo motorcycle camping to short backpacking trips to luxury car camping and on anything in between. It also makes room for a buddy if you want to take your dog or significant other or just want to keep your gear inside the tent with you. Whatever you're buying, consider your priorities — are they weight or space? — and start comparing specs. If you're shopping online, marking out the tent's floor plan on your floor at home with tape will really give you an idea of what you're dealing with. Got some money to spend? This freestanding $390 Big Agnes Fly Creek UL2 weighs just 1 lbs, 15 oz while sleeping two. Update: Corey reports a bad rain infiltration problem on the Fly Creek, instead recommending the $399 Copper Spur which weighs in at 2 lbs and 13 oz. Shopping last season's tents, during sales and from non-big name brands are the most effective ways to save money. If the specs look good, the tent's likely good too. Read the reviews on Amazon first. Spending more money should net you significant weight savings. If it doesn't, look elsewhere. Benchmark that 5 lbs, $100 Alps tent up top, then shop around, trying to take out as much weight as possible within your budget, while achieving your desired amount of floor space, height and features. Like most items of gear in the outdoors, it's best to gain experience with your tent before relying on it in extreme conditions. When you buy a new tent, spend a night outside somewhere easy in it, learn how it works and make sure it's the right tool for the job before expecting it to survive the entire High Sierra Trail or on the side of a tall mountain. Chris Brinlee Jr. shot the nice photos.